Each week, Jesse Goldberg-Strassler and Mick Gillispie discuss The Baseball Thesaurus and the language of baseball, broadcasting and broadcasters, and the big stories of the week on Ballpark Digest on the Ballpark Digest Facebook page. If you missed yesterday’s broadcast, here’s the replay! This week’s topics: The lingo of the game, junkballers; reviewing Phil Rizzuto’s call of Roger Maris’s 61st home run; and broadcaster stories about players with skills beyond baseball. 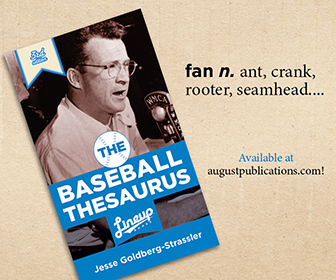 Jesse Goldberg-Strassler is the Voice of the Lansing Lugnuts and the author of The Baseball Thesaurus and The Football Thesaurus. Mick Gillispie is the Voice of the Tennessee Smokies and a spring-training broadcaster for the Chicago Cubs, as well as the winner of the Broadcaster of the Year in the 2017 Ballpark Digest Awards. We also have a bonus Facebook Live chat set up for March 28 at 11 a.m. Eastern, when Ballpark Digest publisher Kevin Reichard will join Jesse to discuss what’s new and improved in MLB ballparks for the 2019 season. That chat will be followed by the regular broadcasters chat at noon Eastern.